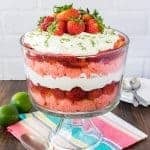 Using store bought cakes and a few ingredients makes these No Bake Strawberry Mousse Cakes an easy dessert to put together for summer parties or dinners. Stay in touch with us. Subscribe to receive BruCrew Life recipes direct to your inbox. Some days you will find me in the kitchen baking up a crazy storm for hours. Other times I want a quick dessert that takes very little time because I have other things to do. This little cake is one of those desserts that doesn’t take much time at all. 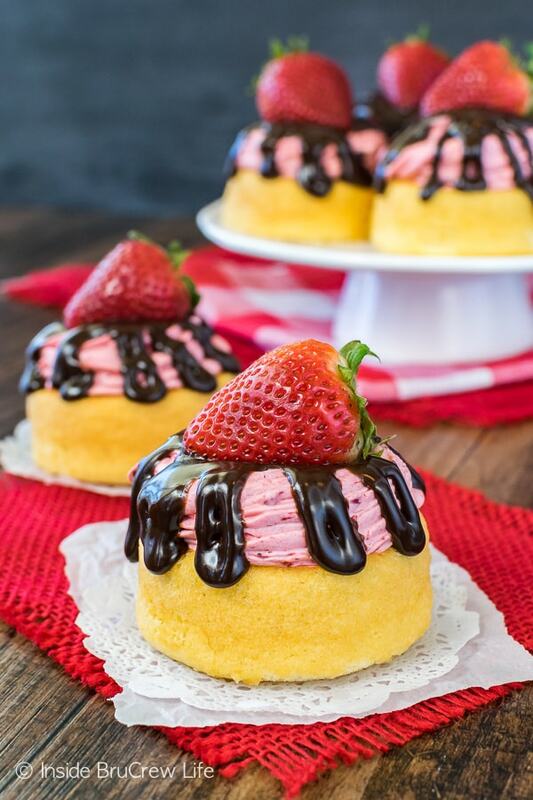 Got to love a dessert that looks like you bought it at the bakery, right? Let’s keep it our little secret that these take less time to make than driving to your local sweet shop. 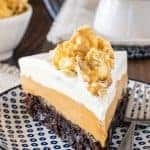 Our church family knows that I am always in dessert mode, so some of them will ask me to make or donate different dessert to dinners that they are helping with. Having a way to get rid of the crazy dessert ideas that I come up with is a very big plus. I get to create fun desserts, take pretty pictures, and then send them out my door without gaining any extra weight. Although, I’m wondering if you can gain weight from just smelling dessert because I do inhale a lot of sugar fumes on a daily basis. This past weekend I got asked if I had any extra desserts lying around because one of our Sunday school classes was going to be serving lunch somewhere. 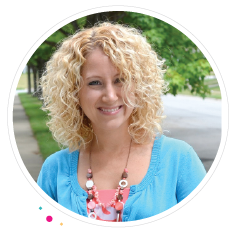 The day before I had sent all the key lime bars from my fridge to the Wednesday night dinner at church. But that didn’t stop me. 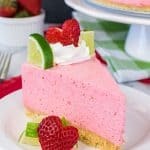 Last year I made this strawberry mousse cake, and it has stayed one of my all time favorite desserts. The thing is that it takes quite a bit of time to put together all the layers. So, I decided to make a fun no bake version that literally only takes minutes to prepare. 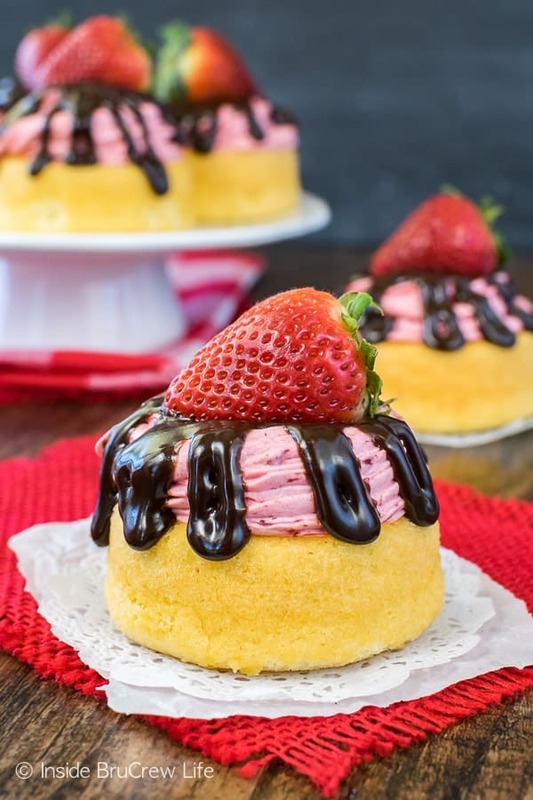 I used little store bought angel food cake dessert shells for the base of these no bake strawberry mousse cakes. Cream cheese, pie filling, and Cool Whip makes a super easy and creamy mousse that gets swirled on the cakes. Feel free to change them up and use your favorite flavor pie filling. 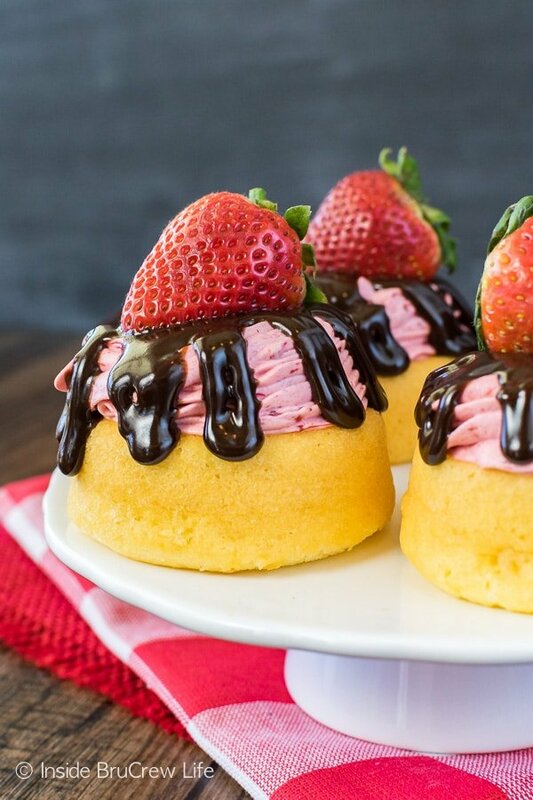 Chocolate and strawberry is a combo that I just can’t resist, so I made an easy chocolate ganache to drizzle over the tops. A fresh berry placed on top adds the perfect finishing touch. In less than 30 minutes you can have a semi-homemade dessert that looks like it came from the bakery. 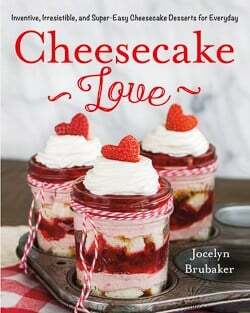 This would be the perfect treat for all the dads and kids to make for mom this coming weekend. Hint, hint. 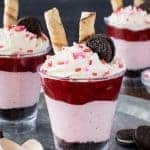 Using store bought cakes and a few ingredients makes these No Bake Strawberry Mousse Cakes an easy dessert to put together. Great recipe to bring to parties and dinners this summer. Beat the cream cheese and pie filling until completely mixed and the mixture is creamy. Fold in the Cool Whip gently. Use a large piping bag and icing tip 1M to swirl the mixture on the dessert cups. Place the chocolate chips and heavy whipping cream in a microwave safe bowl. Heat for 30 seconds. Let sit for 1 minute, then stir until creamy. Let cool 10 minutes. Spoon the chocolate into a ziplock baggie and cut one corner off. 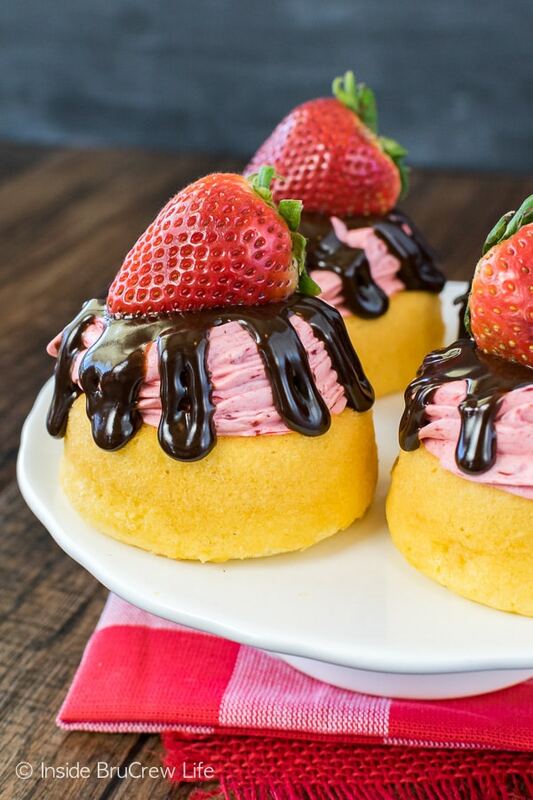 Drizzle over the top of the mousse cups. Place a strawberry on top of each one. Refrigerate until ready to serve. Makes 18 mousse cakes. 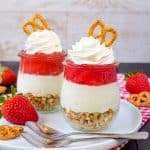 Looking for more easy no bake desserts for your summer plans? 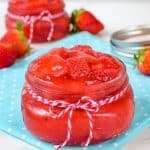 Check out these delicious recipe from some of my friends. These look absolutely perfect for Mother’s Day! Pinned! Looks yummy and easy! Pinning for later! You can definitely change out the pie filling to your favorite kind. Just make sure to beat the cream cheese and pie filling enough to break apart the cherries. I hope you enjoy the fun little cakes! I love the “don’t have to share” aspect and the adorable presentation. I love strawberry mousse too! Gorgeous cakes! Is this correct, to heat the chocolate chips and condensed milk for 30 minutes? Oh, my goodness. No, that should say seconds. Thank you for letting me know. I have fixed the recipe!